A fabulous Victoran Father Christmas Clipart that I’ve retouched and cut out for you. He’s on a PNG file with a transparent backgound, ready for you to drop into your holiday design. He’s from a late 1880s die-cut that says “Germany” on the back. He would be great for tags, stationery, printed fabric blocks, and countless other creative Christmas projects. You’re probably going to see a lot of Santa here, because I’ve collected tons of Santa ephemera over the years. What can I say? I love Santa. 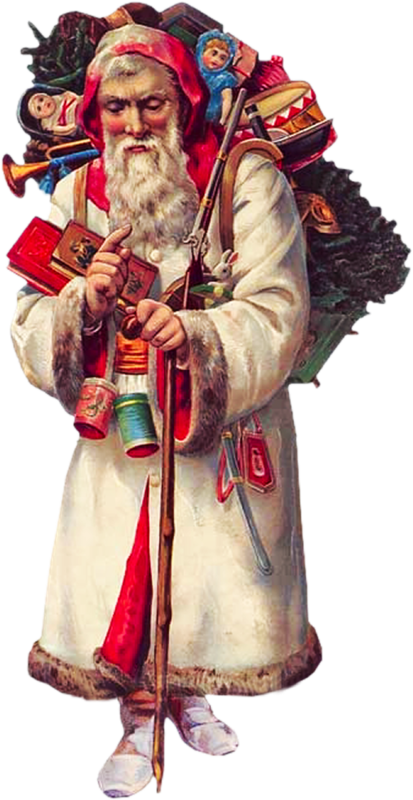 This entry was posted in Christmas Graphics and tagged antique image, Christmas clipart, free clipart, holiday graphics, Victorian Father Christmas Clipart, vintage image on October 21, 2014 by ClipArtPlace. CipArtPlace is owned by Bobette Bryan, a professional writer and designer with more than fifteen years of experience in graphic design. She also owns the popular ButterflyWebGraphics.com, a clipart site which features her 3D artwork.